How this all came about………. My introduction to Wheatens came in 1982 when our family was searching for a good family pet. The boys (three of them) were interested in German Shepherd, Rottweiler, or Doberman thinking they were masculine breeds. I, on the other hand, thought a poodle would be good!!! We settled in the middle on a cute, fluffy but hardy terrier… the Wheaten. It was several years before I was truly into showing and breeding seriously as the boys took most of my time. Once they were older and I had more time to devote to my “hobby” I occasionally showed some of my own dogs. I also used a professional handler to help get them finished as AKC champions because my true calling was as a breeder. I loved rearing a litter of pups and still do! Over the years I have continued to strive for excellence. I have always tried to breed for breed type, good temperaments, and good health. It is a daunting task in these times as we face numerous health concerns. Along the way I added a second breed to our expanding household, a Kerry Blue Terrier. She, too, was a show dog and eventually I had litters of Kerry puppies to raise, too! I finally achieved a dream that took shape somewhere in the middle years, never fully thinking that I would really be able to reach it but still always striving towards it. 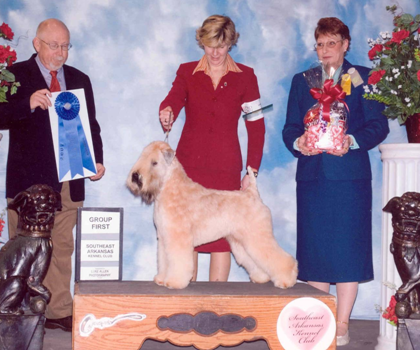 I bred and own a dog that won a Best of Breed title at the 2007 National Wheaten Specialty Show and then went on to win BOB at Westminster in 2008. It was a dream fulfilled. I continue to breed and aim for the same goal for each and every litter, yet know that in reality, most of my pups will be your pets and so I want them to be the best they can be, too.